Cream cheese, whipped cream, eggs, butter, sugar, crackers, cookie-crumbles and an assortment of toppings… with these heavy weight tongue tingling ingredients, it is very improbable that calories can be kept off cheesecakes. 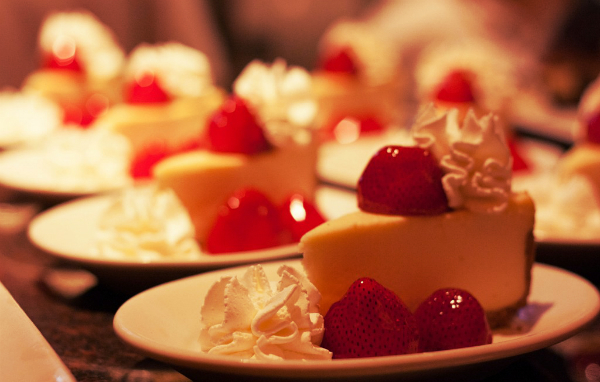 On any ordinary occasion, 100gms of classic cheesecake will add a hefty 320 calories to your system. However, when it comes to justifying your inclination towards these irresistible desserts on the 30th of July, there is practically no logic on heaven and earth that can convince you otherwise. It could amount to an unforgivable crime against your taste buds if you don’t indulge in these creamy delights that are still fighting a battle to establish their nature as cakes or custard on this very day. Weight watchers though, may have plenty to worry about. Standing in perplexity as whether to jump into the oven or the frying pan can cause a lot of stress. On the one hand you cannot handle your conscience if you deny your piece of cheesecake on 30th July and on the other you will never get your peace if you pile up on the calories. To begin with, the golden rule is to make your own cheesecake. Considering the fact that baking is always not necessary and freezing could do the trick, this is perhaps one of the simplest of desserts to put together. Spending the morning of the 28th in the process of making your own cheesecake could save you from beginning to gorge from the first waking hour of the cheesecake day. Secondly, while making your cheesecake, choose all ingredients in their low calorie and low fat form. Be it cream cheese, whipped cream, sugar, crackers or any ingredients for that matter, your local grocery is sure to house them for the calorie conscious lot. Using the right ingredients can cut down your calories by 25% to 30%. Thirdly, cheesecakes are known for their layers. If you try and cut down on the layers of your cheesecake, you will quite naturally cut down on the calories. Maintaining a 3 inch thickness and no more is good for the weight watchers. Fourthly, while choosing your toppings, it would be better to give chocolate and other sugary syrups and miss and use a bowlful of assorted berries with a dash of sugar instead. This will not just enhance the freshness of the cheesecake; it will also keep the additional lard at bay. Lastly, ensure spending the next two days maintaining strict abstinence from junk food. Thankfully, the cheesecake day is followed by the watermelon day on the 3rd August which is sure to leash your calories by a large extent!